Today, designing the kitchen is something more than just choosing the right kind of appliances, lighting, countertops, the perfect design and cabinetry. Instead of stowing in a lot of items in the kitchen, there is a need for minimalism. But the question arises as to what is minimalism, it is not just painting everything in the kitchen white or something light in colour, or it is not getting rid of all the possessions in the kitchen. Minimalism can be made to look more interesting if we add in that creativity touch to it. Minimalism can be trimming down keeping in mind the purpose wherein the results of it would often be something impactful as well as evocative. The focus should be to have a clean and functional kitchen with just the right type of essential in it. There is no boundary when it comes to creating that style statement. Whether you are looking out to decorate your living room or kitchen, there is always room for more opportunity to exert your own style statement to that space. Even when you have that small space in between the kitchen cabinet and the refrigerator but with some thoughtful use of patterns and material, it can be turned into something more interesting to look out for. So for all of those who are looking to take the very idea of minimalism to the next level, read on to see on how that can be done. Space is one of the biggest asset you can have in the house. Space can alter the look of any room, it can either make the room look cluttered and small or it can also make the room look larger. Playing around with the space would make a minimal kitchen look more interesting and eye catchy. But for doing so, you would need to firstly identify all of those places in the kitchen wherein there is space that is unnecessary wasted. Look out for the gaps present in between the shelves, the empty place below the sink, some of the unused corners or the back of the cupboard. All of these spaces are often looked over but it can surely turn out to be useful with some creative thought. These are all of those spaces wherein you can place all your non-essential kitchen items, those items which you rarely make use of. Instead of cluttering the countertop you can make good use of the space as mentioned above. It is essential for not allowing any of the appliances or the kitchen items to take up your precious space leading to distraction. Counters should be kept clean from any of these kitchen wares which are used infrequently. The space on the door or the walls can also be used creatively. You can think about adding a kitchen rail or some hooks on the cupboard sides or the racks wherein you can place some of your kitchen ware. A kitchen which is neat and decorated brilliantly would not seem to be perfect and interesting unless each of the items are placed in their right place. This is said to be one of the first step towards a cleaner and perfect kitchen. All of the appliances and kitchen ware items should be placed at their right place. 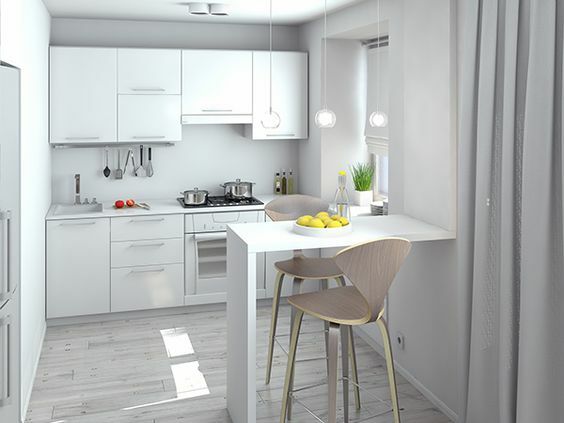 Initially the kitchen would have minimal items but gradually it would turn out to be a storage room wherein you get new items and just store it in the kitchen. Hence whenever you plan to get a new item, think where it would be placed and only get those items that are absolutely necessary. Having drawers and cookware in the kitchen can add to that minimal kitchen look and make it look even more interesting. You can have ceiling to bottom cabinets based on the number of items you have in the kitchen. These cabinets look sleek and you can plan out to store bigger appliances or kitchen ware items as well. Many a times you would be having all the right kind of storage resources but they may not be utilized completely. Hence you can look out for ways to boost the storage even further and ensure that once you place the item in that location, the next time it should be found there itself. For those who have minimal kitchen but are still not satisfied by the way it has come up. You can always rethink about the colour scheme of the kitchen. Remember, simple is the new fashion statement. Do not look out for schemes that are loud and can make the room look over the top. Try to have a simple kitchen scheme. Those white walls in the kitchen can be made to look more interesting by having a contemporary and sleek details would instantly open up the space. Make use of just the right kind of minimal designs, reflective material. You can go in for white glass cabinet doors, stainless steel worktops or just a white tiling for backsplash. Neutral tones are also making the kitchen space look interesting with a contrast detailing. It is all about making the right choices when it comes to designing a clutter free and minimal kitchen. There are often chances that you may tend to go overboard since you would want your kitchen to look perfect. But this is where home owners tend to make mistakes in the need to get everything. Right kind of choices or consulting the designers in this space would ensure that your perfect looking kitchen is more perfect. When you implement the above mentioned strategies then you will find out that the kitchen is not only appealing visually but at the same time it is also much easier in terms of usage. Simplistic designs can surely add more appealing factor to the kitchen and it would benefit in the long run as well. So what are you thinking, have a look at your kitchen and see if there are still ways to improve it further.